1 of 4 Place cookies in food processor and pulse until finely chopped. Add melted butter and pulse until evenly blended. Press into bottom and up sides of a 9-inch pie plate. Refrigerate while making filling. 2 of 4 Combine 2 tbsp of the sugar and 1 tbsp of the cornstarch in a small saucepan. Stir in thawed raspberries and 2 tbsp water. Bring to a boil over medium heat. Cook 3 minutes, until dark red and thickened. Strain out seeds and cool completely. 3 of 4 Whisk remaining 3 tbsp sugar and 2 tbsp cornstarch, the gelatin and salt in a saucepan. Gradually whisk in milk until smooth. Cook over medium heat, stirring constantly with a wooden spoon or silicone spatula, until pudding thickens and begins to bubble around edges, about 5 minutes. Continue to cook, stirring, for 2 minutes. Remove from heat and stir in white chocolate. Let cool 30 minutes at room temperature, then stir in whipped topping. Pour into prepared crust, smoothing top. 4 of 4 Transfer raspberry sauce to a small piping bag. Snip off tip. Pipe dots of raspberry sauce (in a continuous spiral) all over top of pie. 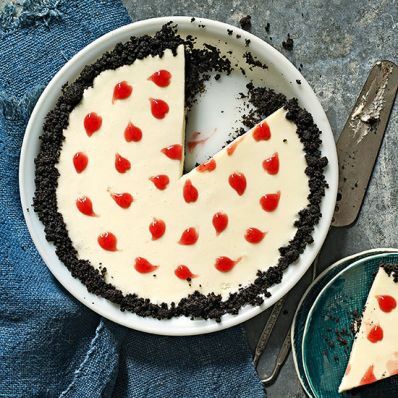 Starting in the center, run a thin knife or toothpick through the drops in one direction, to create hearts (alternately, you can do this after pie is chilled). Refrigerate pie for at least 4 hours or overnight, until firm. Cut into wedges and serve. Per Serving: 2 g fiber, 32 g carb., 7 g sat. fat, 15 mg chol., 147 mg sodium, 3 g pro., 14 g Fat, total, 264 kcal cal.